DETROIT — Four years ago, Rabbi Yisrael Pinson saw the beginnings of a Jewish revival downtown and sought to convince local religious leaders that the city needed its first Chabad House. Chabad is a worldwide movement in which Jewish families open their homes to Jews in the community as “extended family,” offering outreach, support and guidance. Pinson was passionate about his vision, but the leaders were not as optimistic about the city’s future. After all, in 2010, former Mayor Kwame Kilpatrick had not yet been convicted, bankruptcy was still on the horizon. When the search committee (Pinson was a member of the committee) couldn’t find a young family willing to commit to moving to the city, it looked like the plans for a Chabad House downtown might be scrapped. Traditionally Chabad couples move to new places when they are very young, newly married and starting families. The Pinsons most definitely did not fit the mold. Beside the fact the rabbi at age 38 and his wife, Devorah, were raising five children ranging from 8 months to 12 years old, they were also comfortably ensconced in West Bloomfield Township where Pinson served as director of the Daniel B. Sobel Friendship House, a recovery center for addicts and their families. Still, he said he couldn’t stand by if it meant no Chabad House. 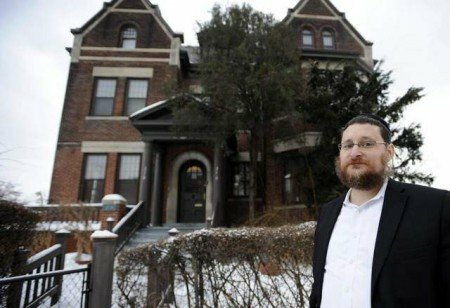 A few weeks ago, a couple hundred supporters braved the frigid temperatures and treacherous roads to attend the open house of Chabad of Greater Downtown Detroit, a stately, three-story red brick 1908 house on Mack in the heart of Brush Park. They raised a glass and toasted to the success of their new emissary’s mission to reach out to the young Jews engaged in the city’s rebirth. At its height in the 1940s, the Jewish population in Detroit numbered some 85,000 residents. They were served by several kosher butchers and close to 50 synagogues. But just as white flight meant a steady exodus of Jews to the northwest suburbs, Pinson likens the urban rebirth to a Jewish homecoming of sorts. Brush Park was once a prime Jewish residential neighborhood that contained several Albert Kahn-designed homes. The original Temple Beth El — now the Bonstelle Theater — can be viewed from Pinson’s back yard. Pinson is a fourth-generation rabbi. His family has been involved in the Chabad movement going back several decades. Born in Nice, France, his parents still run a school there; his grandparents also ran a school in Tunisia in the 1950s. Devorah, too, comes from a Chabad background. Born in Cincinnati, her parents remain active running a Chabad house there today. Gradually Pinson, who’s been educated all over the world and speaks four languages, became involved in the city. He was part of the Menorah in the D observance that commissioned a 25-foot steel and glass menorah that drew some 2,000 people for its lighting in Campus Martius Park in December. Early on, he said he was inspired by Quicken Loans’ founder and Chairman Dan Gilbert and began networking and developing relationships with Detroiters involved in the TEDx Detroit talks, the Techonomy Detroit conference, D:hive and NEXTGen Detroit. Days later, Pinson made an offer on a “perfect” house. It had ample parking, it was zoned both residential and commercial, and was owned by a physician who ran his practice there for 30 years and was only too happy to sell to someone who would care for the lovely home as he had. Mosey is excited about their decision to move from West Bloomfield. Safety being a major concern, Pinson said they appreciate the presence of the Wayne State University police and the security provided by a strong neighborhood association, such as Brush Park’s Community Development Council. Since the kids attend private school in Oak Park, their commute time will hardly change. Right now, the upper floors are being renovated to make it a living space for the family. They are moving in stages, although Pinson said the kids are so excited they would have preferred to move in yesterday. “One of our goals now is to encourage all our friends to move to the city. We’re really talking it up: ‘We’re moving downtown! When are you coming?’ “After all, the Chabad House is all about building community.